Gli Alluminogeni's roots can be traced back to 1966, and to five young friends who met each year while on holiday on the Italian Riviera. Originally formed as a beat group, the band went through several changes of name in those early days and at different points they were known as Green Grapes, Vips, and Bats. In 1968 lead singer Patrizio Alluminio moved from Casale Monferrato to Turin, where most of the band were based, and this enabled them to be more active. Around this time they condensed to a trio consisting of Alluminio (keyboards, vocals), Daniele Ostorero (drums), and Guido Maccario (guitar). 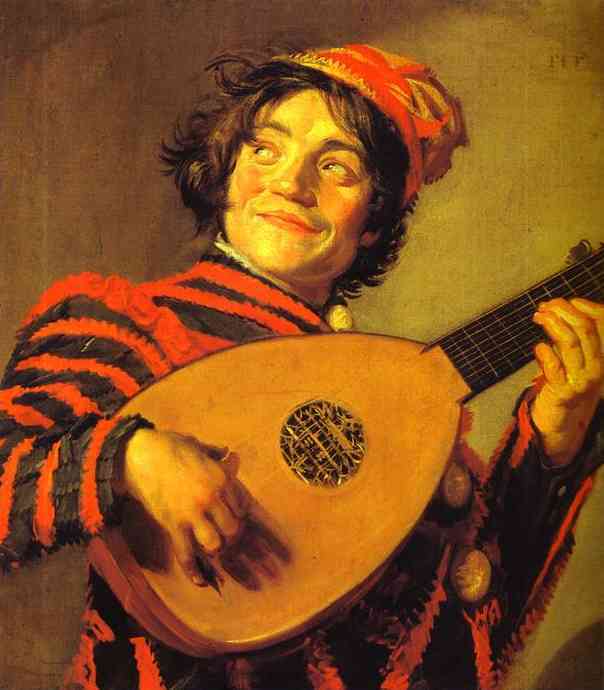 Maccario would prove to be the first in a long succession of temporary guitarists. Further changes of group name ensued, firstly to Terza Sensazione and ultimately to Gli Alluminogeni (after Alluminio who was the most accomplished musician of the three, having graduated in piano from the Conservatorio Viotti of Vercelli). On the back of their demo tracks they successfully landed a recording contract with the Fonit Cetra label. After recording their first single in 1970 they performed in front of 15,000 at the Cantagiro summer festival having had little previous live experience. Over the course of the next two years they released a further 3 singles, and Piero Tonello replaced Maccario as guitarist during this period. In 1971 they appeared at an Avant-garde festival in Viarregio and then supported Gentle Giant on their Italian tour. Also in 1971, Caio 2001 magazine named them the third best band in Italy, behind Formula 3 and New Trolls, and ahead of Le Orme. Another change of guitarist saw Tonello leave and Enrico Cagliero join the band. This new line-up (Alluminio, Ostorero, Cagliero) recorded the soundtrack for an Italian movie in which the band appeared, performing as Troglomen. In 1972 they released the apocalyptic concept album SCOLOPENDRA, a visionary tale with cosmic ecology as its central theme. 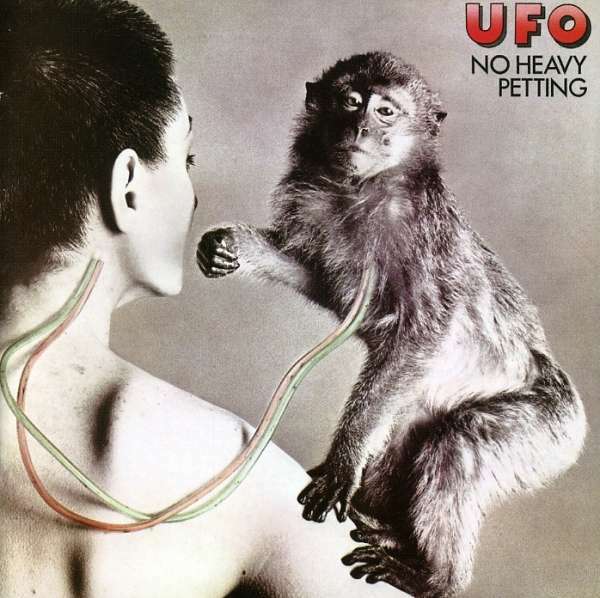 This album was based around Alluminio's Hammond organ and plaintive vocals, but the band members were unhappy with the final production as they felt it sounded too commercial. Their dissatisfaction with the record label, combined with some internal conflict, resulted in the break-up of the band. Consequently, the album wasn't promoted and the split also obscured their participation in the annual Festivalbar song contest in Italy. Patrizio Alluminio subsequently brought out a solo single in 1975, but apart from that one release the different members of...Gli Alluminogeni's roots can be traced back to 1966, and to five young friends who met each year while on holiday on the Italian Riviera. Originally formed as a beat group, the band went through several changes of name in those early days and at different points they were known as Green Grapes, Vips, and Bats. In 1968 lead singer Patrizio Alluminio moved from Casale Monferrato to Turin, where most of the band were based, and this enabled them to be more active. Around this time they condensed to a trio consisting of Alluminio (keyboards, vocals), Daniele Ostorero (drums), and Guido Maccario (guitar). Maccario would prove to be the first in a long succession of temporary guitarists. Further changes of group name ensued, firstly to Terza Sensazione and ultimately to Gli Alluminogeni (after Alluminio who was the most accomplished musician of the three, having graduated in piano from the Conservatorio Viotti of Vercelli). On the back of their demo tracks they successfully landed a recording contract with the Fonit Cetra label. After recording their first single in 1970 they performed in front of 15,000 at the Cantagiro summer festival having had little previous live experience. Over the course of the next two years they released a further 3 singles, and Piero Tonello replaced Maccario as guitarist during this period. In 1971 they appeared at an Avant-garde festival in Viarregio and then supported Gentle Giant on their Italian tour. Also in 1971, Caio 2001 magazine named them the third best band in Italy, behind Formula 3 and New Trolls, and ahead of Le Orme. Another change of guitarist saw Tonello leave and Enrico Cagliero join the band. This new line-up (Alluminio, Ostorero, Cagliero) recorded the soundtrack for an Italian movie in which the band appeared, performing as Troglomen. In 1972 they released the apocalyptic concept album SCOLOPENDRA, a visionary tale with cosmic ecology as its central theme. This album was based around Alluminio's Hammond organ and plaintive vocals, but the band members were unhappy with the final production as they felt it sounded too commercial. Their dissatisfaction with the record label, combined with some internal conflict, resulted in the break-up of the band. Consequently, the album wasn't promoted and the split also obscured their participation in the annual Festivalbar song contest in Italy. Patrizio Alluminio subsequently brought out a solo single in 1975, but apart from that one release the different members of Gli Alluminogeni went on to pursue careers outwith the music industry. Following the re-issue of SCOLOPENDRA in 1991 the band reformed but Cagliero then left, to be replaced by yet another new guitarist Massimo Cabrini. After a meeting with Beppe Crovella, of Arti e Mestieri fame, they decided to record a new album in the original style of the band. The resultant album, GENI MUTANTI (1993), also carries a strong ecological message about the future of the planet. They followed this up with GREEN GRAPES (1994), which contains new and old unreleased material. 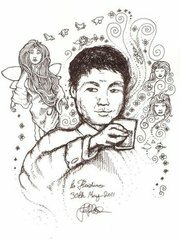 A further album, METAFISICO, had been due for release in 2008 but other than 4 songs that are available via music download sites, this album has never materialised. Watch this space. I have tried for years to give Scolopendra a chance. Its dated production, lackluster composition and plodding musicianship prevent me from enjoying it. Gli Alluminogeni were headed in the right direction but by 1972 their brand of heavy Italian Beat had long since worn out its welcome. And although there are some psychedelic influences and unconventional ideas here and there, they are few and far between and can't save this thing from being dead on arrival. It doesn't help matters any considering the band basically disowned the album upon release, citing label Fonit's mix tampering as "too commercial." Ironically, the poppier moments such as "La Stella Di Atades" succeed most. My opinion is Fonit weren't given much to work with, and did the best with what they had. The most glaring oversight being bass. Not bass guitar; bass frequencies. This album has none. A shrill, trebly mess describes much of Scolopendra, an album fundamentally third-tier and for collectors only. 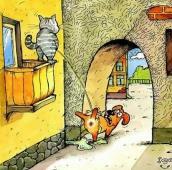 As "La Natura e L'Universo" begins, you notice immediately something just isn't quite right. The sound is phasey and disorienting, but not in a good way. This is not space rock. Despite its length, the song never really goes anywhere or does anything. I guess the silver lining is Daniele Ostorero's drumming, but even that becomes annoying by the 8-minute mark. The titular "Scolopendra" sounds a little better, adding Mellotron and acoustic guitar to flesh out the stereo image a bit more. The opposite is true of "Che Fumo C'e." A flanger effect has been added to the drums, relegating them to the background and ruining an otherwise decent track. "La Stella Di Atades" may be the best song on side one, but even it never gets off the ground and simply deteriorates. Side two starts with the excellent "Thrilling," by far the best song here. Gli Alluminogeni sound serious, determined and actually interested in what they're doing. A heavy tandem of molten guitar and overdriven Hammond organ lead the charge while Ostorero shows power and restraint in equal doses. Vocals enter near the end and give the song a haunting vibe, amply supported by some epic pipe organ. "Thrilling" sees a band fulfilling their promise, albeit briefly. "Cosmo" returns to a kitschy ELP-inspired sound. "Pianeta" ends this uneven and unsatisfying album. If nothing else, "Thrilling" is worth repeated listens, but the ratio of bad to good is too high to really recommend Scolopendra. Unsatisfied with the Fonit's production on ''Scolopendra'' Gli Alluminogeni split up after the release of the album with Patrizio Alluminio recording a single in 1975, which was actually a leftover from the ''Scolopendra'' recordings.Many years later the original trio returned recording two albums for the Vinyl Magic label, ''Geni Mutanti'' (1993) and ''Green Grapes'' (1994). 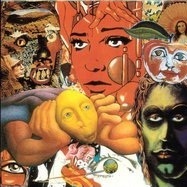 Of the two release ''Green grapes'' seems the one to fit better with the group's legendary past.It contains 13 old and new recordings of smooth Prog/Psychedelic Rock with also plenty of Melodic Rock tracks.Not every track in here sounds inspired with the old recordings sounding close to the style presented in ''Scolopendra'', while the new ones are closer to the likes of modern Italian Rock.The standard organ-driven Psychedelic Rock pieces of the album are decent with a dramatic atmosphere, good vocals and a nice rhythm section, a couple of them are even great as the opening ''Lauda Dell Amore Mistico'' or the instrumental ''1969'', with the instrumental parts shining, led by Alluminio's massive Hammond organ waves.The new recordings though are far from the beautiful style established by the band in early-70's.They appear close to cliche melodic Italian Rock, far from the word progressive, based on easy tunes, plastic synths, catchy refrains, soft pianos and accesible rhythms, but some of them even sound pretty dull compared to the vintage-sounding tracks of the release. At this point the story of this legendary Italian trio comes to an end.It is strongly recommended to stick with the band's fantastic debut, but if you are among those collecting everything related to Italian Prog, ''Green Grapes'' has still some good moments to offer...2,5 stars. 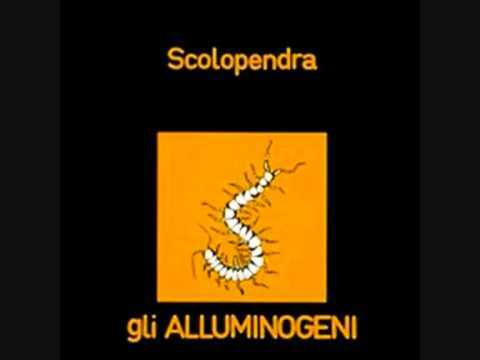 Scolopendra is the debut album of the italian trio "Gli Alluminogeni". The band got the name from the leader, Patrizio Alluminio, student at the academy of music of Vercelli and graduated in piano. The main feature of the seven compositions is the typical sixties flavour of both vocals and instrumental passages. This gives the impression of a dated work, unlikely to the band's other contemporaries. Notwithstanding, the music is very well composed, recorded and arrenged and it's based upon the majestic hammond organ of Alluminio (sometimes church organ as in the heavy psychedelic "Thrilling") and raw electric guitar. It's not a concept album but the recurring themes are nature and cosmos. The title track is a wonderful soft-blues ballad. Gli Alluminogeni is another RPI band which began life in the mid 1960s as a beat band, this one from Turin. After going through a few guitarists and releasing some early singles, the band recorded their lone album (aside from the reunion stuff two decades later.) Despite coming out in the classic period "Scolopendra" is an album that does not stand up that well today. In fact some reviewers claim it was outdated the day it came out, hearkening back to 60s blues-psych as opposed to grasping the wave of advancements other Italian bands were surfing by 1972. I tend to agree, this is not first tier RPI and not a huge priority. That's not to say there is nothing enjoyable here. I think blues/psych rock fans who love early Purple and worship the Hammond will find plenty to enjoy. Chunky power chords, trippy sound effects, and muscular drumming all contribute to an album for the jam aficionado. The band is reasonably tight, the vocals just average. I enjoy organ with a dark and desolate tinge and that is the main selling point in my opinion. The guitar work is acceptable but nothing special. One notable track is "Thrilling" which mixes some gothic organ with Sabbath-like doomy power chords. Average songs, reasonable performances, a bit behind the times. That's about it. Oh, don't forget the hideous album cover art. With all that is out there from the RPI classic period to pillage your bank account, Gli Alluminogeni should be way down on your list of acquisitions. It's not all that representative of the best attributes of the genre in my opinion. More for hard-rock, psych/blues-rock fans. 2-3 stars, I'll round them up. After a very long hiatus, this Italian band got back together and released this album which is a mix of old and new unreleased songs. I can't say that I am pleased with this mix. Some songs sound quite outdated ("Lauda Dell' Amore Mistico", "La Casa Dei Riflessi", "Eravamo Alla Fine Del Mondo") and just average. No wonder that most of this material was never released before. On top of this, the production is quite loose. I wonder who could be attracted by such an album in the middle nineties... Nothing to be compared to the great old Italian bands of the early seventies, nothing complex to be considered interesting in terms of "modern" sound. So, what's left? There is a weak instrumental ("Opera"), a fine rock-folk ballad with a decent emotional aspect ("Antichi Riti Di Magia") which is probably the best song out there. A vague rock-tinted simulacra ("Sulla Soglia Del Peccato"), a melodic and syrupy ballad ("Nuove Speranze"): all this being more embarrassing than joyful. My favorite from this album is the solid and psyche "1969". This is a very good instrumental track which features a great beat and some powerful organ. It is just too bad that the band didn't investigate a bit more into this direction. The quite Floydean "Incubo" is another example. It is as crazy as ASOS and quite a decent number. It is a rarity amongst such a weak ensemble. The only song with English vocals should have been remained unreleased really. "Cry For Me" is a pitiful exercise. You should n't really care about this album. I'll be generous for once: two stars (but this is really on the upside). "Gli Alluminogeni" is an Italian band which took birth in the early seventies and was reborn some twenty years later. This album is by far the best of their production and is a good mix between psychedelic music with an Italian accent. The former aspect is more on the front line. But it's OK as far as I'm concerned. The great opener "La Natura E L'Universo" is the best example I can think of: some good drumming and of course this solid Hammond organ sound available throughout these eight minutes of good music. In all honesty, the music featured on this album is not always really great ("La Stella Di Atades") but once in a while, some tracks do hold fine moments, like the intriguing "Thrilling" which features some hints of "Fools" from "Deep Purple" (on their "Fireball" album) during the instrumental intro. But the whole of this song is quite challenging: fine guitar and as usual a deep and heavy organ sound typical of the early seventies. This is another highlight with no doubt. The music is mostly instrumental, dark and heavy oriented. If you like "Black Widow", there are great possibilities that you would appreciate this band as well. Especially during the great closing number "Pianeta". A gorgeous treat of Hammond fantasy! Some weaker songs like the title track or "Cosmo" prevents me to rate this work with four stars. Seven out of ten really! These guys originally started out during the 1960s as an Italian beat group called Green Grapes. They subsequently changed their name to Gli Alluminogeni (taking their new name from keyboardist & vocalist Patrizio Alluminio) and reinvented themselves as a melodic prog band at the turn of the 1970s. Like many other Italian bands of the period they had a short life span and disbanded with only one album under their belt. In their case the break- up was due to conflict with their record label over the quality of production on the album, which is a bit ropey to be honest. After the reissue of Scolopendra in 1991, the band reformed with a new guitarist and released a couple more cds in the following years. Scolopendra's gatefold sleeve proclaims ''During a very strange journey... a cosmic dawn'', and the majority of the song titles are based on themes of Nature and the Cosmos. The album starts and ends with sound effects of nature and an explosion respectively, so there seems to be some kind of apocalyptic concept at play here. The overall sound is a bit dated for its time of release, and there's a fairly strong psychedelic influence with most tracks built around Alluminogeni's Hammond organ. The aforementioned production doesn't help in this respect either mind you. So, after a moody intro with some sound effects of birds and insects, LA NATURA E L'UNIVERSO finally gets going around the 2-minute mark with some brief vocals and then a bluesy Hammond workout. This is a promising start to the album but there's an incongruous psych-pop guitar section tagged on at the end of this track. The next three songs all continue in melodic rock vein, and a couple of them include real orchestral backing. The title track is probably the best of these with its memorable Hammond refrains. By the way, the genus Scolopendra contains the largest and most dangerous of the centipedes, but I'll be blowed if I know how a centipede fits into the overall concept. Apart from COSMO, which is a short no-frills instrumental blues-rocker, the second half of the album is more mature with greater thematic development and longer instrumental passages. The keyboards ebb and flow to good effect on the darkly psychedelic THRILLING, as the muffled tones of pipe organ alternate with swirling Hammond and meaty guitar licks. Closing track PIANETA's forceful guitar riffs, majestic organ, and damp squib explosion then round the album off nicely. Scolopendra is one of the lesser-known RPI releases therefore it's not one of the places to start if you're new to the genre. However, if you can overlook the poor sound quality it's actually not too bad an album. Next a bigger centipede, ALLUMINOGENI sent out bigger double-chained gene with their bridges. Their previous work Scolopendra was a pop-progressive album. And after their 15-year split, ALLUMINOGENI could release an album with their real interests...I've heard. Really? The first track Mass Media can start with aggressive keyboard sound and THE BEGINNING can hear exactly progressive but the content of this song is not like a progressive rock but heavy and catchy. Yea, not-technically-good Patrizio's vocal is very passionate and attractive, and their sound and melody are so pop, as Scolopendra is so. Some of the songs in the album are heavy, some are like a stream, and some are gentle and melodious. Basically their identity is heavy but pop...I guess. In this period, might this work be typical Italian Progressive Rock album...? But, especially Pat's voice has nice and happy taste so I love. A bigger centipede will attack you! Unexpectedly this terrible sleeve made me laugh and buy itself. Oh, but how catchy and easy-to-understand this sound by GLI ALLUMINOGENI is. Even in that peak of Italian prog period, they produced this album in accordance with commercialism of the label company. Sadly the commecialism itself should sprit GLI ALLUMINOGENI out. In their songs, track 1, 4, 6 have a bit flavour of pregressive rock but in them we can find their suffering against the Italian pop style. I guess, no I'm sure, that they should want to push their progressive principles. They re-unioned in 1993 and released Geni Mutanti, on which they should play with their policy and principles. For above-mentioned reasons, this work is not essential progressive rock one but should put ALLUMINOGENI seal on the period, I consider. Ugly title and extremely ugly cover, I don't think they helped ALLUMINOGENI to increase the number of fans. But the music is far from being uninteresting. Variety of keyboards (Hammond, grand and electric piano, pipe organ), acoustic, electric and 12-string guitars, drums and bass provide solid sound. In fact the trio sounds like 4 or 5-piece band (don't know whether they were able to reproduce such sound in live performances). I also like Patrizio Alluminio's voice, not very distinctive, but clear and pleasant. Not an essential work, but if you are already familiar with Italian greats and would like to widen your horizons it's worth to check out this album. Fans of Hammond organ sound will be especially pleased.